While strolling through a local comic shop this past weekend, I came across the very first Starman trade paperback! I own the individual issues (#0 – 5), and I realize the beautiful yet expensive omnibuses are available, but this first trade is special to me. 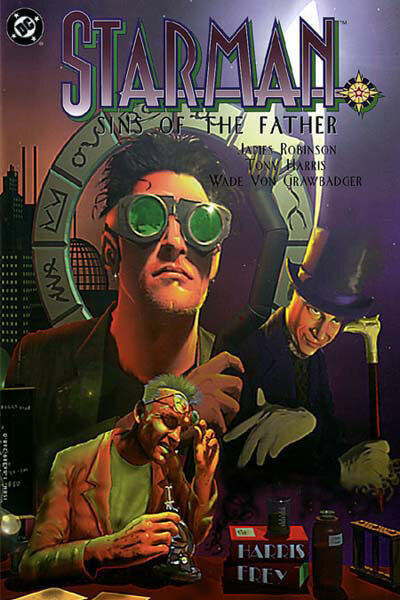 It was first collected in 1996, a time when trade paperbacks were uncommon. You really knew DC believed in Starman because of these trades. I was pleased to get it at cover price, thinking it was extremely scarce. Now that I look online, paying $12.95 was a fair price for a second printing. Worth noting is the cover looks sort of odd, like a poor digital scan. Weird. If you’ve never read Starman by James Robinson, Tony Harris, and Wade Von Grawbadger, you really should. It was truly groundbreaking at the time. Nowadays it may not seem like a trailblazer, but it’s certainly still a good read. Part of the reason I bought this trade (even though I own the issues) is to loan and get others addicted!